As Dissection fell apart at the peak of its power due to the incarceration of its frontman and creative force, rhythm guitarist Johan Norman went on to create a new band with touring drummer Tobias Kjellgren. The formation initially went by the name Reaper, but eventually settled on Soulreaper, named after one of the songs Norman that wrote for the Dissection swansong “Storm Of the Light’s Bane”, to avoid copyright infringement. A lot more influenced by US death metal than Dissection, specifically “Covenant” by Morbid Angel, Soulreaper, who existed from 1997 to 2004, released two albums. Of these two “Written In Blood” was the first, and probably the best at that. Soulreaper consisted of Dissection alumni Johan Norman (rhythm guitar) and Tobias Kjellgren (drums). Rounding out the line-up are relative unknowns as Christoffer Hermansson (lead guitar), Mikael Lång (bass guitar) and frontman Christoffer Hjertén. Each of the members had experience with prior bands but none ever amounted to anything substantial. 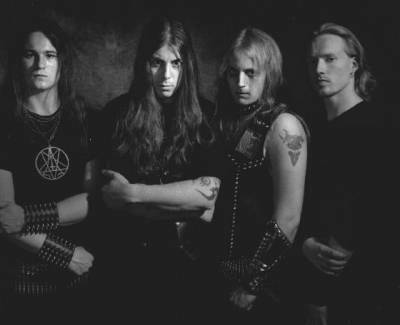 Only frontman Hjertén, a more than capable and versatile vocalist in his own right, had prior experience with early black metal band Mastema, but his presence wasn’t able to elevate Soulreaper beyond mere functionality. Soulreaper debuted on Nuclear Blast Records as a result of the connection that the Dissection alumni had with the label. The brand would not prove strong enough and “Written In Blood” was its only for the German label imprint. As Norman had a hand in Dissection’s more straightforward death metal oriented songs it isn’t much of a surprise to see him return to that particular well. The genre was winning in popularity again after the second wave (symfo) black metal explosion, and the advent of the more brutal subset of the US death metal sound. Yet as crunchy and functional as “Written In Blood” sounds it’s hardly a revitalization of the genre. Its combination of traditional American aggression with a Swedish melodic sensibility works purely on a visceral level, but on a conceptual level Soulreaper is as bland as its album title and vanilla occult lyrical fodder suggests. 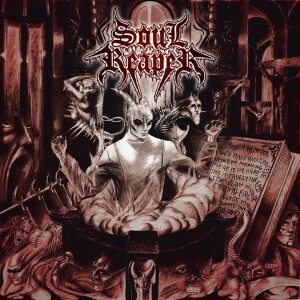 Soulreaper suffers from a similar fatigue and regression that Deicide and Morbid Angel experienced in the early 2000s. The semi-acoustic intro to ‘Written In Blood’ is build around a variation of the central melody to the classic Dissection song ‘Where Dead Angels Lie’ visit the website. There are even more ties to Dissection abound on this album. ‘Satanized’ was the signature song and ideological vessel of the shortlived Satanized, a one-off project from Jon Nödtveidt and Johan Norman that released a solitary demo in 1991. 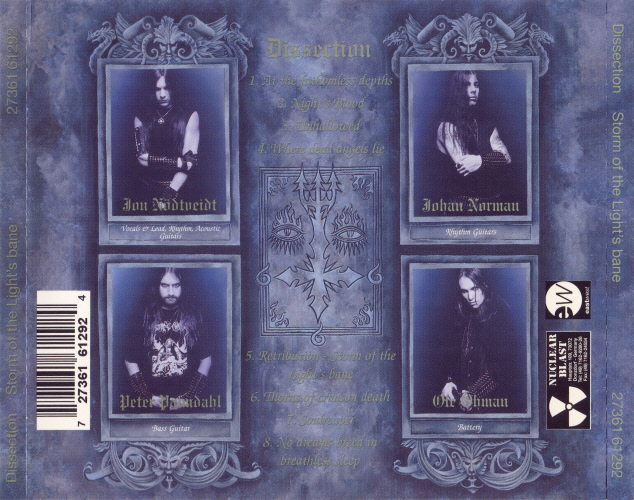 The song was recorded in an earlier form on “My Shadow…”, the lone Decameron album from 1996, the death metal band that Tobias Kjellgren figured into before his involvement with Dissection. The strongest tracks of the album are ‘Seal Of Degradation’, ‘Subterreanean Might’ and ‘Labyrinth Of the Deathlord’. ‘Satanized’ on the other hand stands out for all the wrong reasons, and in just how much it differs from the remainder of the album. The most interesting, and perhaps most telling, aspect of “Written In Blood” is that its strongest songs were co-written by a member no longer involved with the band. Johan Norman wrote ‘Darken the Sign’ in its entirety, and he had a hand in all other songs of the album as well. ‘Ungodly’ was penned with input from bass guitarist Mikael Lång. 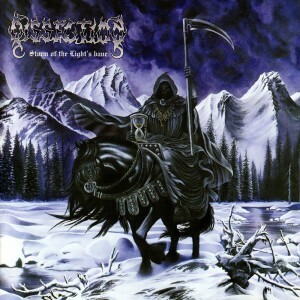 The trio of ‘Written In Blood’, ‘Subterreanean Might’ and ‘Labyrinth Of the Deathlord’ were co-written by Johan Norman and original lead guitarist Mattias Eliasson. ‘Seal Of Degradation’ was co-written by Johan Norman and Christoffer Hermansson. It seems only logical that Norman and Kjellgren broke ranks with Dissection as they wanted to branch off into more straightforward and less traditionally influenced direction. “Written In Blood” was recorded at Gain Productions with Dikk Tator producing, and mastered at the prestigious Cutting Room facility in in Stockholm, Sweden. As expected with Nuclear Blast the production is bass-heavy, crunchy and modern. Especially the drums sound incredibly concrete and powerful. The bass guitar has a rumbling deep tone but it never amounts to anything more than providing the required amount of low end rumbling. The cover artwork was rendered by Robert Ekeroth. The original band logo, which only features on this album, was created by Nicklas Rudolfsson. As most things about Soulreaper “Written In Blood” was good, but just not good enough to appeal to a wider audience beyond the one they had established with their involvement in Dissection. Soulreaper and its debut were eclipsed by bigger bands and album despite its lineage to Dissection, and the power of a major label behind them. While far from terrible “Written In Blood” wasn’t able to hold its own against other Scandinavian, and European, releases of the time. While possessing enough grit and concrete heaviness to appeal to a more American audience “Written In Blood” lacks in truly unique characteristics to differentiate it from other Swedish acts. Norman’s brief connection with Dissection allowed him to launch his own unit, ultimately Soulreaper wouldn’t prove resilient enough to evolve into an entity worth mentioning. “Written In Blood” is too by-the-book to be in any way mandatory.